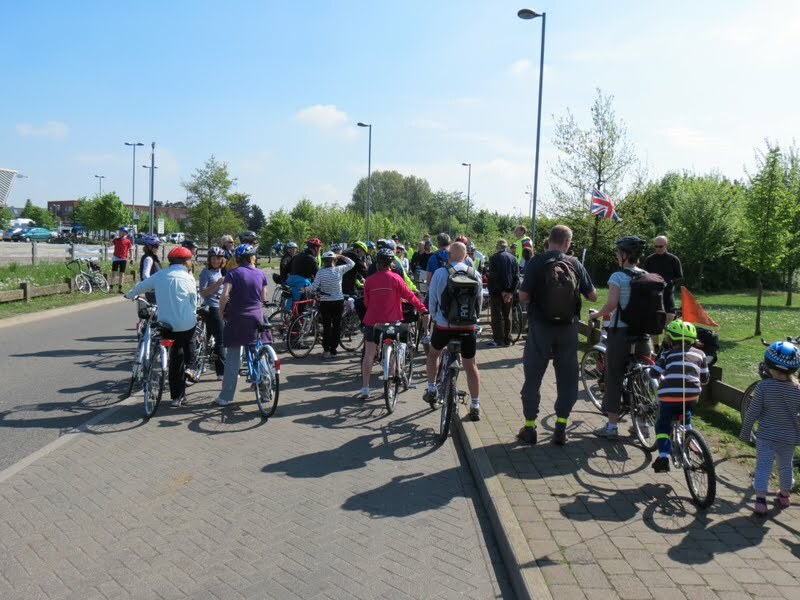 The second annual A10 Corridor Cycle Campaign Awareness Ride took place on Sunday 18 May 2014 with simultaneous rides starting at Trumpington Park and Ride and Royston Heath, meeting at Phillimore Garden Centre, Melbourn. Oliver Heald MP was on hand to wave the Royston cyclists off. Julian Huppert MP, who co-chairs the all-party Parliamentary Cycling Group, saw off the Trumpington riders. 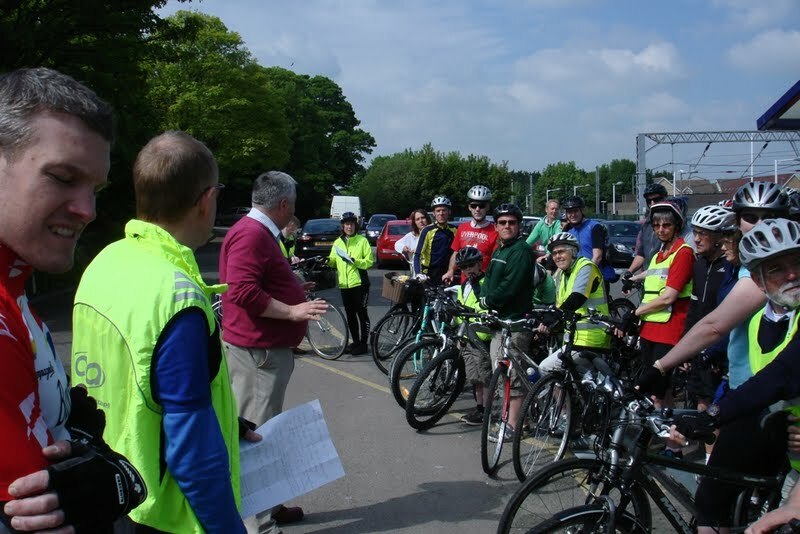 Royston spokesperson Matthew Scales said, “The Royston ride saw 45 cyclists taking in a great deal of the newly developed cycle paths in and around the Burns Road area, as well as the fantastic Coombes Hole railway underpass. 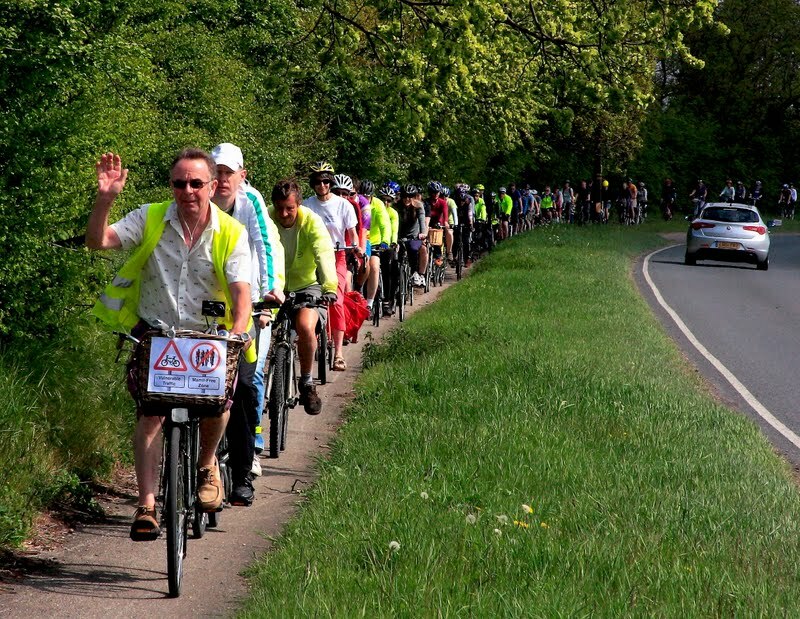 Meanwhile 40 cyclists from Trumpington had to cross the M11 roundabout. 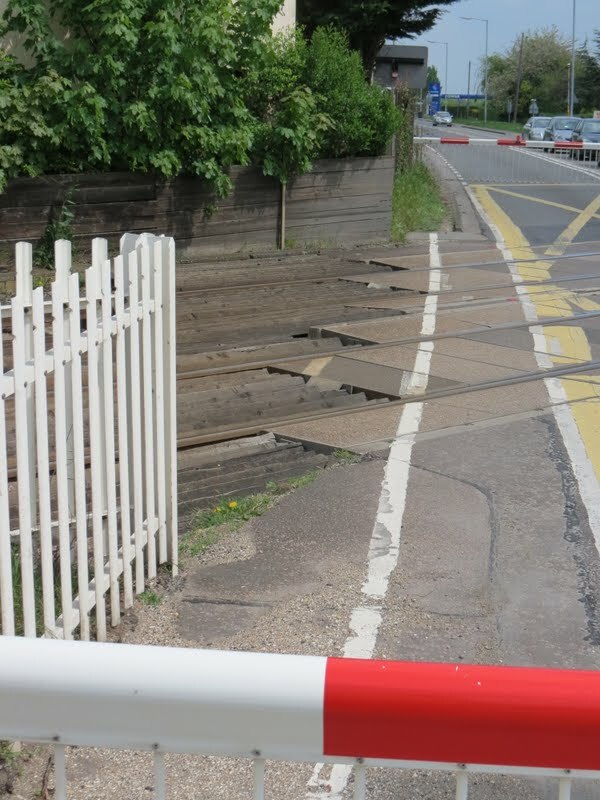 A new cycle path currently under construction will soon connect Trumpington and Hauxton via the nearest farm bridge, allowing cyclists to ride safely off-road. Mrs van de Ven said, “Harston is fraught for pedestrians and cyclists, as they are forced together on a narrow path along busy drives. 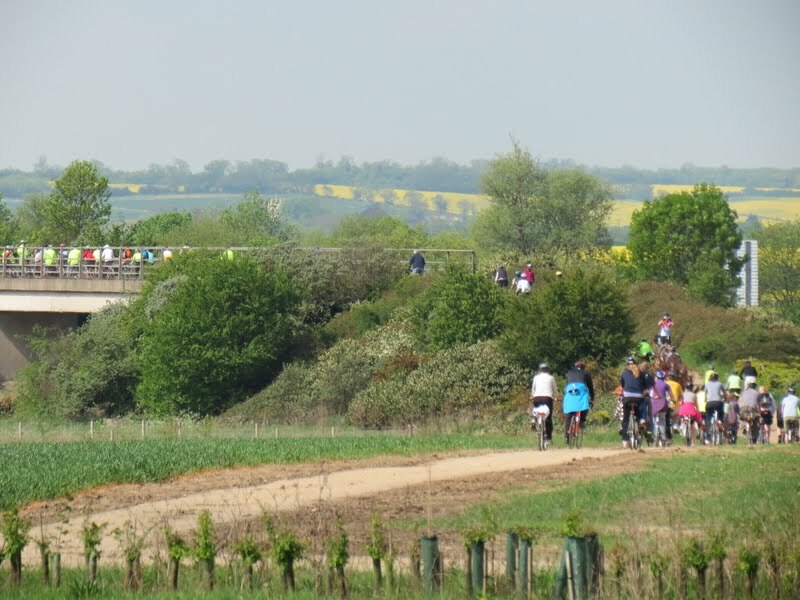 When we arrived at the brand new cycle path connecting Foxton to Shepreth, we experienced instantly what is possible for the whole of the A10. You can cycle confidently if you are on a smooth surface, out of the way of traffic – that’s better for everyone. 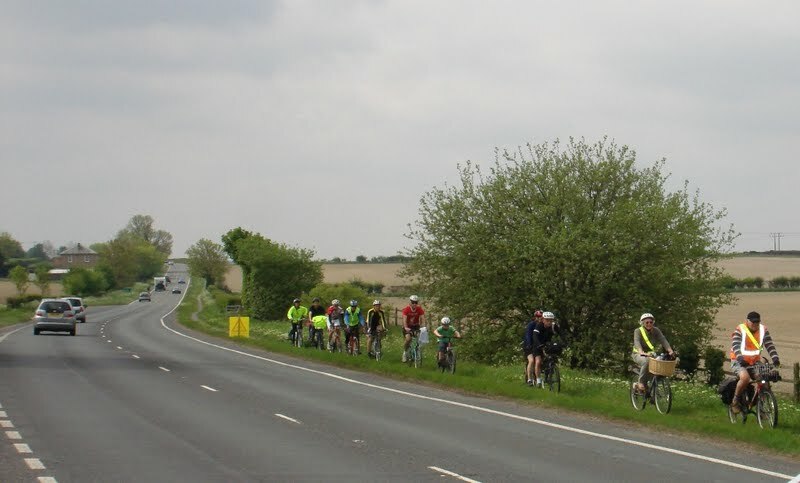 On Sunday 19th May, many cyclists from in and around Royston came together to take part in an awareness ride for the A10 Corridor Cycling Campaign. 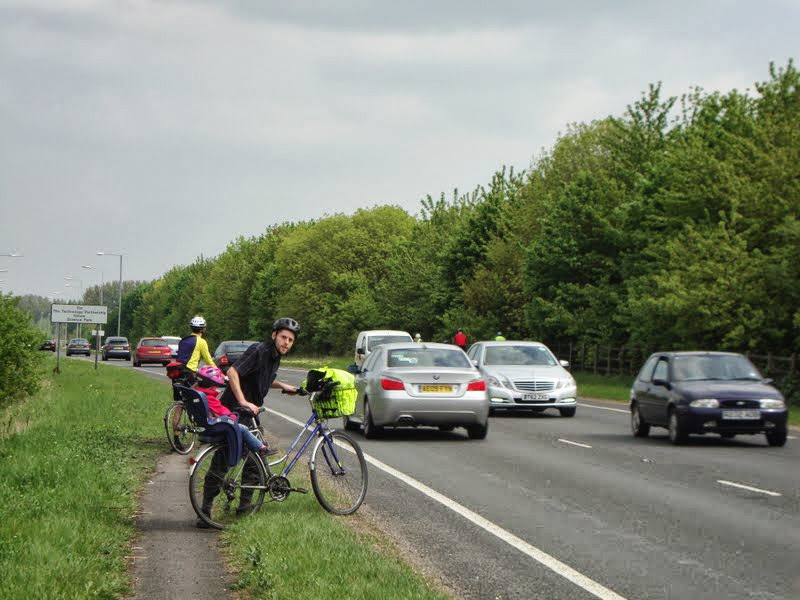 The campaign’s aim is to enhance cycling provision out of Royston and north along the A10, all the way to Cambridge. This includes the need for a safer means of crossing the A505. We were overwhelmed by the number of cyclists which came to participate. 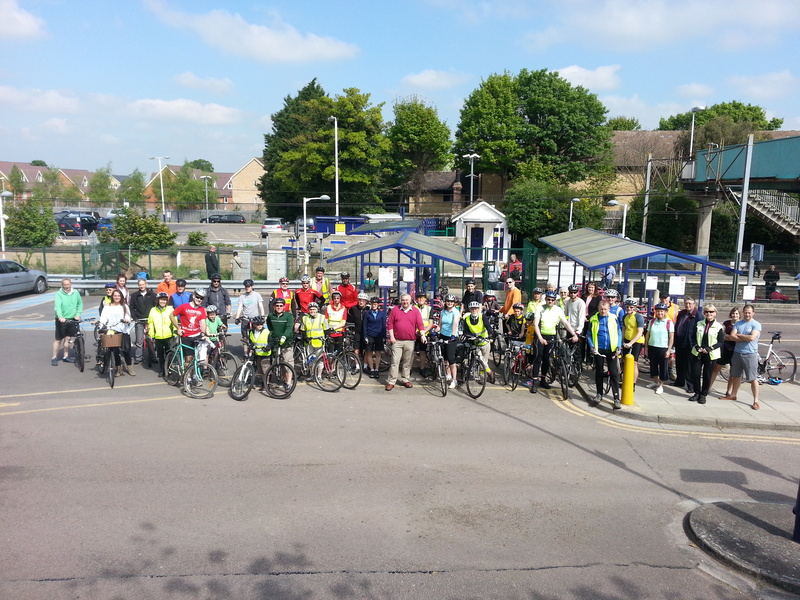 50 riders of all ages met at Royston train station to show their support for the campaign. Not only did local residents come to give their support, but we were also lucky enough to have Oliver Heald, MP for North East Hertfordshire and County Councillors Fiona Hill and Tony Hunter and Royston Town Councillor Elizabeth Freeman attend and give their full support and backing. 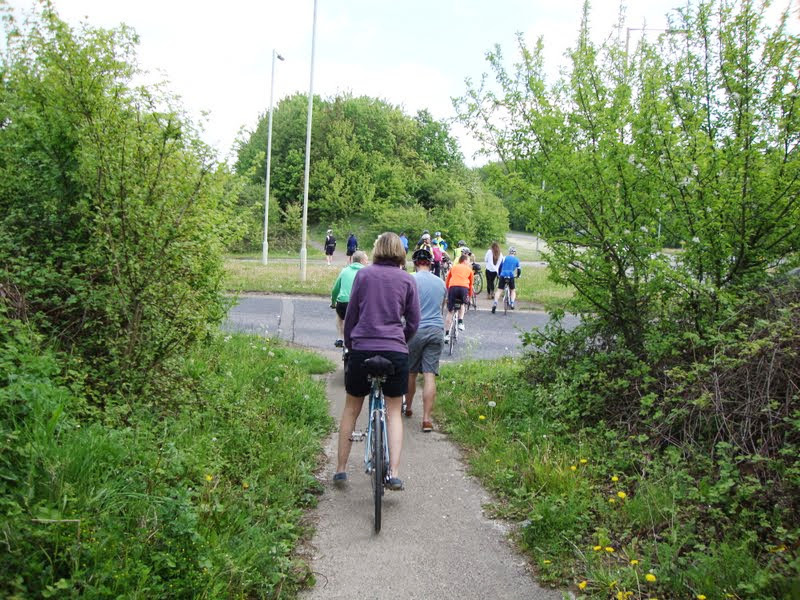 After a group photo call and an inspiring speech from MP Oliver Heald, all riders made their way through Royston, taking advantage of the excellent new paths and cycle ways which have been introduced to Royston in the last few years. As the 50 strong group passed under the Sustrans railway underpass and on to the Melbourn Road, it became clear to all that at this point Royston’s excellent cycle provisions end. Poor quality and narrow paths would take us to the A505 where appointed marshalls aided everyone’s safe crossing amongst the fast moving traffic. The ride alongside the A10 certainly did its job in making all participants aware of the poor conditions of the existing narrow footpath. The fast moving traffic of the A10 means many cyclists only feel comfortable to ride on the pathway, and it was obvious to all that it wasn’t up to the task. challenging A10 towards Melbourn, the Cambridge group faced obstacles of interrupted pathways as well as the inherent dangers of the level crossing at Foxton before also arriving safely in Melbourn. The excellent team behind the campaign ensured all 140 cyclists were suitably refuelled and refreshed whilst stories of the demanding rides were exchanged. We would like to thank everyone who took part in helping to raise the profile of this campaign, as well as friends and family who came to show support. We would also like to thank our sponsors and everyone who made a donation before, on or after the ride. A big thank you also to MP Oliver Heald and Councillors Tony Hunter, Fiona Hill and Elizabeth Freeman for showing such great support. The ride was a huge success far exceeding our expectations. 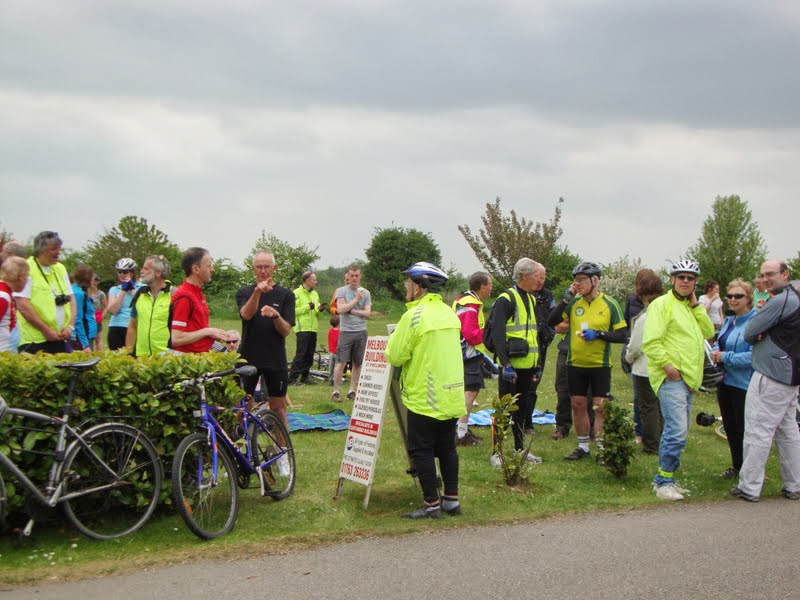 Over 70 riders gathered at both Trumpington and Royston each. The media was represented by two TV crews from Anglia and BBC East while the Cambridge News sent a photographer. Several senior politicians were present including Oliver Heald MP and Sir Graham Bright. Cambridgeshire County Council was represented by Patrick Joyce. 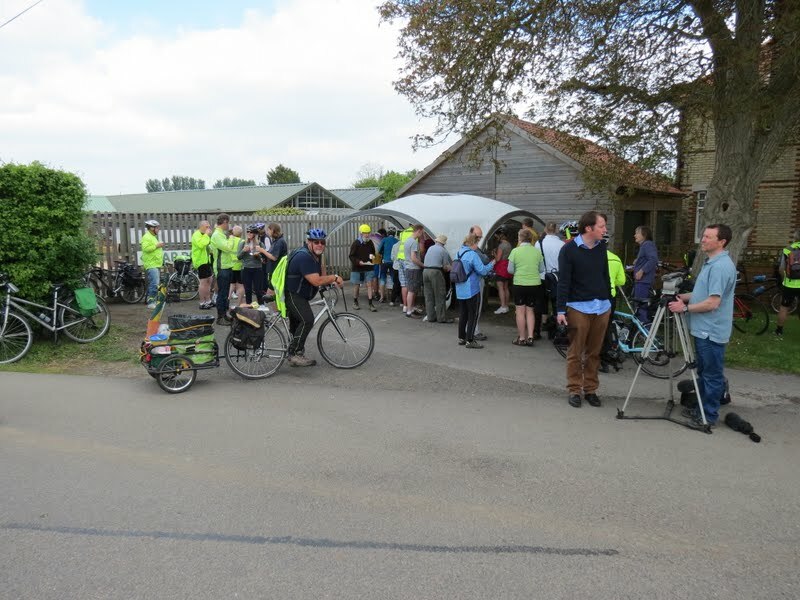 Several cycling groups including the Cambridge Cycling Campaign, the CTC , Thriplow Riders and the Ashwell Cycling Club were present. 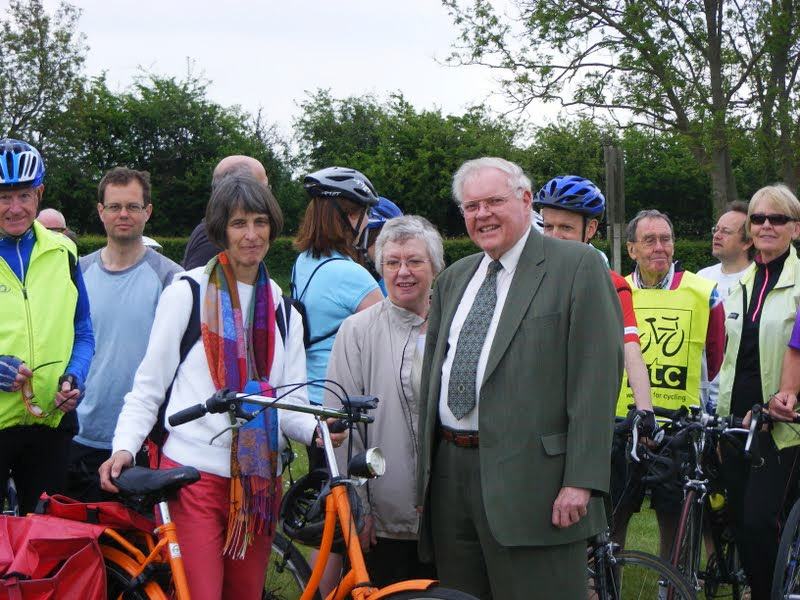 Susan van de Ven our local County Councillor who thought of the A10 campaign rode the route from Trumpington. We had several apologies from MPs and even the Minister for Transport. All were wishing us well. The Start was on the Trumpington Park and Ride site which is just over two mile south of Cambridge. There are first class cycle links from here into Cambridge. 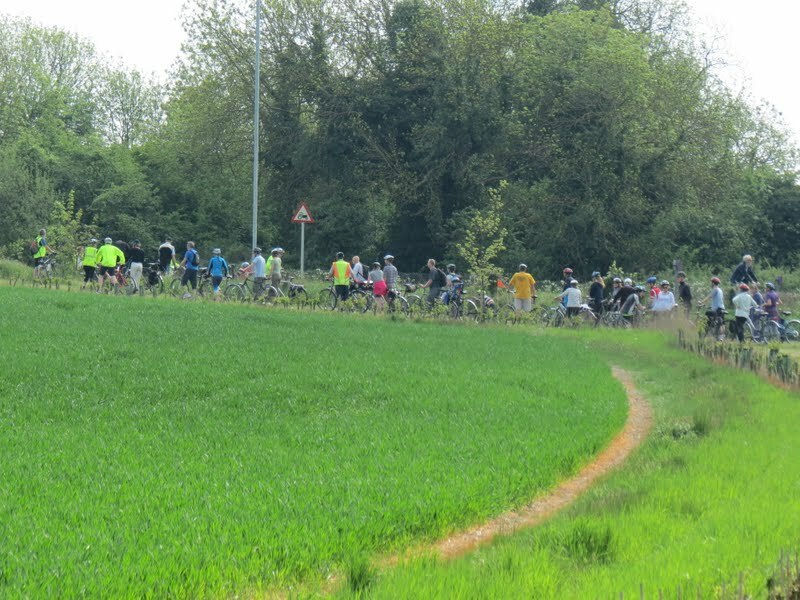 The northern ride started out by riding across the field which is going to form the Trumpington Meadows Amenity Site. We were waved on our way by the site manager for the new development. The site is a huge area on either side of the M11 linked by its own accommodation bridge. The area beyond the M11 stretches down to the river which is about ¾ mile away and full of wildlife. There is also an area where Coprolite was mined in the late 19th Century. Finally we returned to the A10 through a handy hole in the fence. 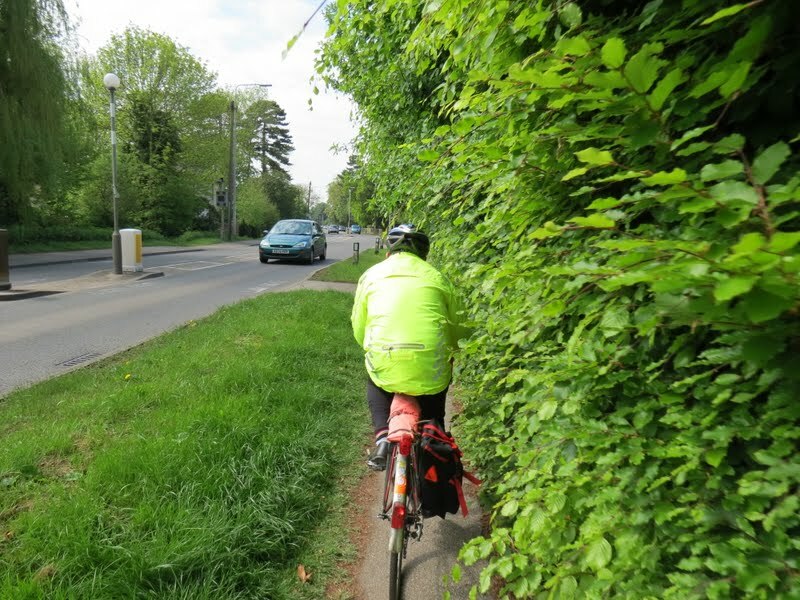 Then on through Harston which is a significant problem as the path is too narrow and has awful sight line and overhanging hedges which narrow the path. There are a whole series of entrances. At the end of the village there is a very narrow path directly beside the A10 with built in lamp posts. From here to Foxton Crossing the path is fairly good since the volunteers have cut the Brambles back. At the crossing we diverted via the Barrington Road to cross at the pedestrian crossing over the railway. The crossing was working properly which is unusual. The path on towards the Dunsbridge Turnpike is fairly good provided you avoid the overhanging mile post. Just before the Fowlmere Road the path narrows and the surface is terrible. From here to the Weavers Shed, where we had decided to cross, the path was narrow and a bit uneven. We had decided to cross at this point because local riders had advised us that the crossing at Frog End was dangerous and usually had an accident every fortnight. Sight lines at the Weavers Shed are very good and we stationed a Marshal on the far side. In the event the crossing went without incident. One motorist seeing a large crowd waiting stopped the traffic so the cyclists could cross. This also happened on the Royston Ride. The ride continued to Phillimore Garden Centre where tea, squash and cakes were provided by the café and dispensed by our volunteers. We used 100 cups so we assume there were more than 100 riders and supporters (final count was over 140). The Police Commissioner for Cambridgeshire was in attendance, Susan van de Ven provide an interview with the TV crew. The riders from the Royston Group arrived shortly after those from Trumpington. The Royston Ride started from the Station. It was seen off by the local MP Oliver Heald. The initial part of the ride was along the new cycle tracks in the Burns Road Estate and led to the new tunnel under the Railway at Combes Hole. Then it swung north beside the A10 to the bypass formed by the dual carriageway A505. The crossing, on grade, at this point is awful as the sight lines are bad and traffic is moving very fast. Fortunately there were no incidents. It took a significant time to make the crossing. The path from here to Melbourn has several sections that are very narrow and very bumpy and are downhill. The crossing at Greenlow Kennels is on a very fast section of the road but the sight lines are relatively good. The crossing was made without incident. Once again a motorist stopped the traffic to let the riders cross. The road through Melbourn gave no problem as it is fairly wide and the traffic expects to have to slow down. It does not have a 20 mph speed limit as a local pressure group objected to an offer from the County Council some years ago. The group arrived safely at Phillimore Garden Centre. We had support from a wide range of local businesses, shops, the County Council, County and District Councillors, the Cambridge Triathlon Club our MPs and the media. We were even blessed with perfect weather which in a spring which has been very cold was a miracle. All in all it could not have been a better ride and clearly achieved its objective of showing the need for better off road paths and crossing points. Sustrans are initiating a study as to how to move forward and the County is trying to obtain grants for the Foxton area. A huge thank you to all who supported us.